Getting pimple on lip can be a painful experience. 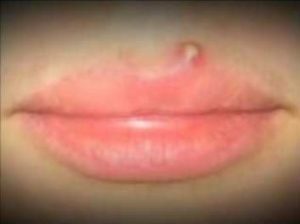 You may even mistake one for a cold sore or other type of ulcer. One thing you do know for sure is that they hurt. You may be wondering how one even got started there, or if something else is going on. There are some common causes of lip pimples and we‘ll explain helpful tips on how to deal with them when they pop up. What Causes Pimples On Upper Lip? You may be using low quality cosmetics that contain ingredients that clog pores. This includes lipstick, lip glosses, balms to prevent chapping, too much foundation and powder, and products you may be allergic to. If you are rubbing the lip area too hard when applying your makeup or lipstick, you could be grinding debris into your pores and blocking them. If you wax your lips to remove hair, you may tend to get more pimples in your lip area. While it isn’t necessarily the wax, the ripping of the strip may irritate the skin and hair follicles, causing inflammation. It can also leave the pores open to bacterial growth. You may notice a breakout within days of a wax. If you have threading done on your upper lip to remove hair, this can also irritate the lip area and cause pimples to form. It is a milder form of hair removal, but can still cause inflammation and exposure to bacteria. If you are going through hormonal shifts (pregnancy, menstrual cycles, menopause) you may be more prone to acne. This can affect just above the lip line causing pimples near your upper and lower lip area. During puberty, sebum production steps up and may cause more pimples. Stress is a big player in the acne game. If you are stressed and have breakouts, you may notice more pimples near your mouth and lips. If you eat more greasy foods, you may be clogging up the pores near your mouth area. Spicy foods may also irritate your lips and cause inflammation that can lead to pimples. What Are the Ways to Get Rid of It? Wash your face daily or twice a day with a gentle face wash. You can use a spray toner to help remove excess oils. Once a week, use a good mask to help pull out debris and deep clean your skin. If cleaning your face isn’t enough and you are feeling more pressure and pain, you can try a steam treatment to help open the pores. Take a pot and fill it with water. Bring it to a boil and place it on a flat surface that is heat-safe. Bend over and put your face into the steam rising from the pan and cover your head with a towel. Stay in this position for at least 5 minutes. Wash your face and pat dry. You can do this daily until the pimple drains. You may need to change lip products to something geared for sensitive skin. Believe it or not, beeswax products tend to be less comedogenic (pore clogging). Make sure the products you choose do not have heavy fragrances or flavorings. The less chemicals the better. You can try a drying agent for pimples on upper lip such as, benzoyl peroxide. A dot of this can help kill bacterial growth and dry up excess oil. It also has a drawing action that can bring the pimple to a head. Citrus fruits contain alpha hydroxyl acid in them that can help remove dead skin to help pimples heal, or never even get started. They also contain nourishing vitamins and minerals to feed your skin. Try dabbing fresh squeezed citrus juice on pimples daily. Grab a plastic bag and put about 4 to 5 ice cubes in it. You won’t need much. Place the ice pack on your lip over the pimple. Green tea has powerful antioxidants that are good for your skin. Sip on green tea daily. As an added bonus, you can use green tea as a facial toner or rinse on your face. Nourishing your skin from the inside out can help prevent breakouts. Make sure your diet is high in; fiber, fresh fruits, fresh vegetables, lean meats, nuts, and drink plenty of plain water. Try to avoid squeezing or popping pimples. You can make them worse or cause an infection. If you’re a lip biter, try not to do this. Lip biting can transfer bacteria from your mouth to the inflamed pore. This may cause an infection or irritate the pore further. Stay away from acne trigger foods: caffeine, potato chips, chocolate, processed foods, cookies and cakes. What's the Harm of Swallowing Toothpaste? Does Getting a Cavity Filled Hurt?